Open scene: A quiet weekday evening in Blacker Hovse. The South Hovse complex fire alarm goes off. All the Moles file out onto the lawn by the Athenaeum. Security Guard: No one here is in trouble, I just need some information about what happened here before we can turn the fire alarm off. Blacker RA, Dustin: (sighing) Well, I’ve never seen a group Prisoner’s Dilemma go so well. Lots of Moles enjoy doing outdoorsy things — we have a yearly Hovse camping trip in the desert, a yearly ski trip in the Sierra Nevadas, and plenty of outings that people organize throughout the year. Caltech is in a great place if you like this sort of thing — Pasadena is nestled right against the foothills of the San Gabriels, and there are even trailheads within walking distance of campus (and certainly within biking distance)! There’s a nice variety too. One weekend this February I was walking on the beach in Malibu (about an hour’s drive from campus), and the next weekend I was skiing at China Peak with the Hovse! If you want to go a bit further away, Joshua Tree, Sequoia, Yosemite and Big Sur are all beautiful and definitely reachable from here if you have a car and a few days off. 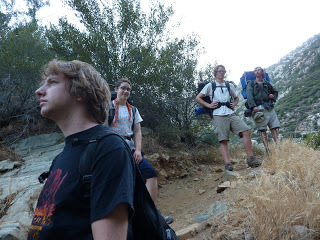 Anyway, this weekend I went backpacking with four other Moles: Brad (the Hovse President and a rising senior like me), Rae (a rising junior) and Ben and Kurt (who both graduated this June). We started at Heaton Flat, in the mountains a bit northeast of Pasadena, and followed a trail that went along the East Fork of the San Gabriel River. We knew there were a number of trail camps along the path, so we figured we’d hike until we got tired and set up camp. However, as always seems to be the case, there were a few difficulties that made sure we got our fair share of adventure. First of all, it was hot. Ridiculously, absurdly, ungodly hot. It was so hot that Ben drank something like 11 liters of water on the first day (although he also biked to the trailhead while the rest of us drove) and that a block of cheese we brought changed its phase of matter by the end of the day. We had forgot Gatorade powder, so instead we ate straight salt (and it tasted delicious! one way to tell when you are running low on electrolytes). Luckily we were never far from the river, so we did quite a lot of swimming and splashing to keep cool. In addition, the trail was incredibly poorly marked and our map was not very detailed, so it was quite a challenge to figure out where we were and where we needed to go on the way in. As we lost and regained the trail, we ended up fording the stream something like 10 times and scrambling up a lot of hills and through thick brush. As it got later in the day, no one we passed seemed to know where the trail camps were, despite them being labeled on our map. …and over a strange bridge called “The Bridge to Nowhere” (although not the one in Alaska) that looked like it belonged on a highway somewhere, not on a poorly marked, eroded trail! There is a bungee jumping outfit that operates on the bridge on Saturdays and Sundays (and is apparently the only legal place to bungee jump in California), but we passed by too late on Sunday to get to try. By the time we got to the bridge, it was getting close to 6, and we were hot and tired and had no idea where the first campsite was. But we kept along the river, along a section called “the Narrows,” aptly named as the canyon closes in here and the water moves quite a bit faster. Soon after the bridge our trail disappeared and we ended up just wading straight upstream. Luckily, we spotted a clearing on a hill above the river, which happened to be the first campsite we were looking for. It was a beautiful spot, with a view of the canyon cliffs and the river. We set up camp, ate a well deserved dinner and went to bed as soon as it got dark. We got an early start the next morning, and headed out at much quicker pace — it helped that the sun was still rising and that we knew where we were going (we only had to cross the stream 3 times this time)! We stopped for a long break to swim, and then headed home. I had an awesome trip, and I hope to have many more expeditions this summer. If you’re looking for adventure, you’ll find it here!